While Tanu and Manu charted a filmy course to save their marriage, Tini and Manu (my wife and I) charted a different path based on lessons we learnt during our spiritual journey. 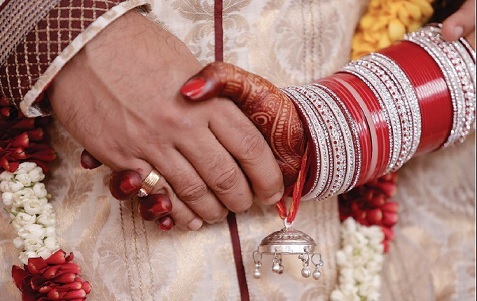 Marriage is a serious business and based on the sacred teachings of our guru– disciple lineage, we present here certain principles that may help in maintaining a good marriage life. These are subjective views, and by no means the last words on this topic; so learn whatever you can, and if you need more help, please consult professionals. In the modern world, people mostly enter relationships to satisfy their carnal desires. But the purpose of marriage, according to the Vedic system, is to create an atmosphere between a man and woman by which they can strive for higher perfection of self-realization. That is what the rituals of the wedding ceremony are meant to impress upon the couple. Therefore, traditionally, in all societies, during marriages people take vows in a spiritual place. They take vows before the Lord to help each other to become pure and enlightened. They consecrate together a partnership in the service of the Divine. But unfortunately so often in marriages today, the entertainment and the fun is there, but there are no blessings, no God. Spiritual training changes our vision about our spouse. He or she is not just our husband or wife, but also a beloved child of God; someone who is being entrusted in our care. Thinking thus if a husband protects his wife, encourages her, makes her happy by giving her a sense of real value, by being a good spiritual inspiration for her, then he will give great happiness to God, our Original Mother and Father, Sri Sri Radha-Krishna . But if he treats her in a selfish, egotistic way, by being neglectful or abusive, then he commits a great offense to God. Similarly, a wife should think the husband to be the sacred, beloved son of Radha-Krishna . Then by protecting him and assisting him, physically, emotionally, and spiritually, by giving him a sense of encouragement, by creating a spiritual environment in the home, and by providing love she will please Radha- Krishna . On the other hand by being neglectful, selfish or egotistic, she makes an offense to them by causing pain to their son. Nothing good is easy in this world. Cheap things come easy. It’s easy to be illiterate; it is difficult to become a doctor or a scientist because it takes commitment and responsibility. It’s easy to be immoral; it’s very difficult to maintain integrity and morality when there are so many temptations and fears to distract us to a corrupt life. It’s easy to do whatever the mind and senses dictate; it’s difficult to control them and do what’s actually good. So it’s easy to have a miserable marriage. But it’s very difficult to keep dharma in the center of our marriage. The reason is a very simple, psychological one: everyone has a false ego and when two false egos are living together, they do not always match. Different views, different opinions, different desires. The nature of mind is that sometime we like each other and sometimes we don’t. Sometimes we are happy, sometimes sad, and sometimes angry. The ego, the mind, and the senses are all very flickering. Where once it was, “How can I live without you?” now it’s “How can I live with you?” The romance of early times, the compatibility, personality, and everything else changes with time. Moreover, at the time of marriage, we only know something about our spouse. But as time goes by, we learn things that we could never imagine, and it’s not always what we wish or expect. If we really want our relations to have deep substance, meaning, and performance, then from the day of marriage, throughout our lives, we have to, deeply within our hearts, accept that our relationship is based on higher principles. We have to focus on the sacred principles, the divinity that has brought us together, and somehow or other adjust and harmonize whatever may come in our lives. We have to tolerate our different conditionings, disagreements, and individual idiosyncrasies. We have to forgive each other for our transgressions. As long as we think with ego, “I am right, you are wrong,” we make no spiritual progress. And if we have children, we will ruin the mentality of the children when they see these ego battles in our house. It is about heart-to-heart sensible responsibility to each other for higher principle. In this regard, I am very inspired by the story of dear friend, an M.D. married to a doctor. They had a brief courtship after their marriage was arranged and fell in love with each other. Shortly after marriage, however, the wife developed a psychiatric illness. She became paranoid and delusional and would repeatedly call police, feeling that her in-laws and her husband were planning to kill her. Police would harass the in-laws, but could not find any substantial proof against them. She refused any treatment. Her parents and family, thinking that she was right, threatened my friend. He tried to explain that it was a medical condition, but none believed him. Finally when the girl was taken by her parents, and there she began to accuse them of plotting to kill her, did they finally realize that she was sick and needed treatment. This was a long ordeal running into years, and even now the wife is a far cry from the women my friend fell in love with. But he is still with her and their kids, tending to their every need. I asked him what kept him going. He gave credit to his spiritual foundation. He is a devout Sikh, reads the Bhagavad-gita, and often unwinds by singing shabads from Guru Granth Sahib while playing harmonium – alone. No, I am not talking about throwing in the towel and walking away, but instead hanging in there, taking a deep breath and exhaling out all your anger and frustration, and . . . just forgetting it. Phew ! At one marriage ceremony, Srila Prabhupada told a story of Mahatma Gandhi. In his auto-biography, Gandhi tells of how he had a fight with his wife. It was a heated battle and they both became extremely emotional and it came to the point where Mahatma Gandhi shouted at his wife, “Get out of my house.” So she cried and left. This is a serious incident. Mahatma Gandhi was the inspiration for many people for nonviolent change within the society. He was against fighting, but here he was fighting with his wife. That is the nature of marriage. If Mahatma Gandhi could not keep peace in his house, don’t feel that we will be able to do it. He was much more experienced, empowered than any of us. Anyway, Gandhiji was still angry. He came out and found the wife sitting outside the house. “What are you still doing here?” he asked. “Where am I going to go?” she cried. “Alright,” he said, “forget it. Come back in.” And everything was resolved. No problem anymore. Sri la Prabhupada explained there is a simple formula to resolve the differences we have. The formula contains two words – forget it. That means we should not let our spouse’s trivial mistakes or wrongdoings to fester in our thoughts and kill us. Nor should we use them to demean our spouse. Sometimes forgetting the demons of past is the path to sanity. Lord Rama appeared in this world like a human to teach us by His example. When He was banished to the forest, mother Sita sacrificed all the comforts of royal palace to be with Her beloved. For Her wherever Rama was, that was Ayodhya, and without Rama even Ayodhya was like a forlorn forest. That is the standard of a wife. Sacrifice is what nourishes real love. What was Rama’s sacrifice? He was constantly making Sita happy. And when She was kidnapped by Ravana, He walked by foot from Nashik through the entirety of India down to Hampi, Kiskindha-ksetra, searching for Sita. When Hanuman found Her in Lanka, Lord Rama fasted for several days to cross over the ocean. Then He declared one of the greatest wars in the history of the world just to protect Sita. That is a husband. In India, every man wants his wife to be like Sita. But it doesn’t work unless the husband becomes like Rama. Now, nobody could do that. But we should follow that principle. The principle is in hard times and good times and health and disease, whatever our disagreements, whatever our conditionings of the past, this loyalty to each other for the service of Krishna is the path of perfection. This commitment is depicted in a story narrated by a friend. Shortly after his sister was married, his brother-in-law’s business collapsed. They could hardly afford two square meals in a day. My friend’s parents proposed that their daughter could return to them and they would take care of her. The husband could visit her on weekends and meanwhile try to stabilize the business. The wife refused. She opted to be with her husband and support him. Now they have a very happy family and are well-off. Her support of husband in that difficult situation won her his love and respect. – Excerpt from One Life Is Not Enough, by K. Natwar Singh, Ex- Foreign Minister of India Foundation of any relationship is respect and care for each other. Through that affection can grow into actual deep love connected to the soul. More important than physical care is emotional care. It is here where usually marriages could go off track. On emotional platform we have a responsibility to make each other happy, to help provide a fulfilling life. Everyone needs appreciation and encouragement. So many wives feel that the husband doesn’t care or like anything they do. On the other hand the husband may love everything, but fail to say it in words. It is important to understand that your spouse is not going to know what you are feeling unless you tell them. Communication is so important. Sometimes in marriage we communicate with everybody except the person who we are living with. Honest communications, where we express our appreciation and affection in a way that we encourage each other, is very critical for a proper relationship. Marriage shouldn’t be just something that we are tolerating just because we took vows. It should be dynamic, vibrant, real, and connected to the divine, where the struggles are not depressing but are spiritual challenges that we have to meet together. Every time we overcome those challenges we come to a higher spiritual platform. Diamond is originally a piece of coal that’s under pressure for millions of years. Gold is purified when it is put in fire. Mother nature is speaking to us this wisdom that by faithfully passing through the good times and the bad times, the easy times and the hard with each other for a higher cause, we will come closer to our spiritual goals. 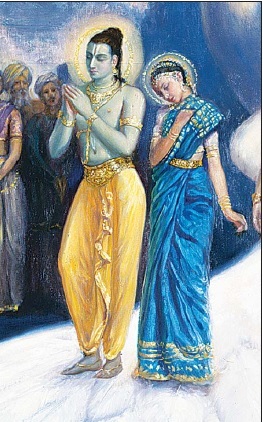 The path to perfection in gåhastha ashram – true spiritual marriage – is to remain totally faithful and chaste to each other, to never act in a way that our spouse will be suspicious or in anxiety, keep Krishna in the center, serve the Lord’s devotees, chant the holy names of the Lord and hear His glories, make our home a temple, and be charitable and kind to society. Then our home is Vaikunöha, the spiritual world. Murari Gupta Dasa (MBBS, DNB Family Medicine) is a family physician. His other interests are photography, reiki healing, and mysticism. Visit his blog at: diaryofmgd.blogspot.in The article is based on the talk given by His Holiness Radhanatha Swami Maharaja on the occasion of the author’s wedding.